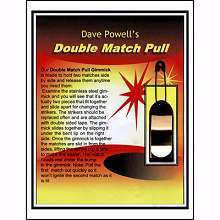 The Double Match Pull Gimmick is made to hold two matches side my side and release them any time you need them. Examine the stainless steel gimmick and you will see that it's actually two pieces that fit together and slide apart for changing the strikers. The strikers should be replaced often and are attached with double sided tape. The gimmick slides together by slipping it under the bent lip on the right side. Once the gimmick is together the matches are side in from the sides, lifting the spring clip a little to make this easier. The match heads rest under the bump in the gimmick. Note: Pull the first match out quickly so it won't ignite the second match as it is lit.